New York, September 16 — With over 8 million visitors each year, Empire City Casino is the place to go to get your game on. 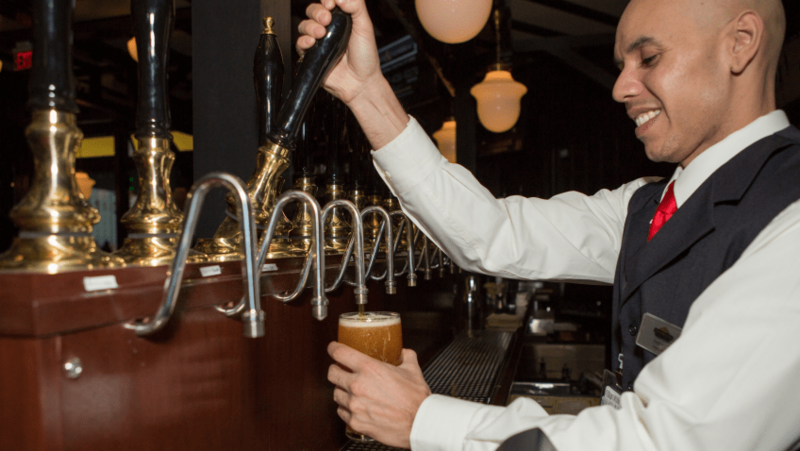 And with a recent $50 million expansion that added two beer-centric new restaurants, a bowling ultra-lounge and expanded gaming floor, Empire City has upped the ante and also become a destination for beer-lovers across the tri-state area. Featuring more than sixty beers on tap from over thirty craft breweries across New York State, it comes as no surprise that Empire City’s Pinch American Grill (pinchusa.com) has just been announced the Best Beer Selection Award winner in this year’s Best of Yonkers contest held by the Yonkers Chamber of Commerce. Beer connoisseurs will appreciate the Fall selection of specialty brews, some of which will be exclusive to Pinch, such as Southern Tier’s PumpKing, Warlock, and Crème Brulee brews, as well as Kuka Smoked Pumpkin Porter and Brooklyn Oktoberfest. 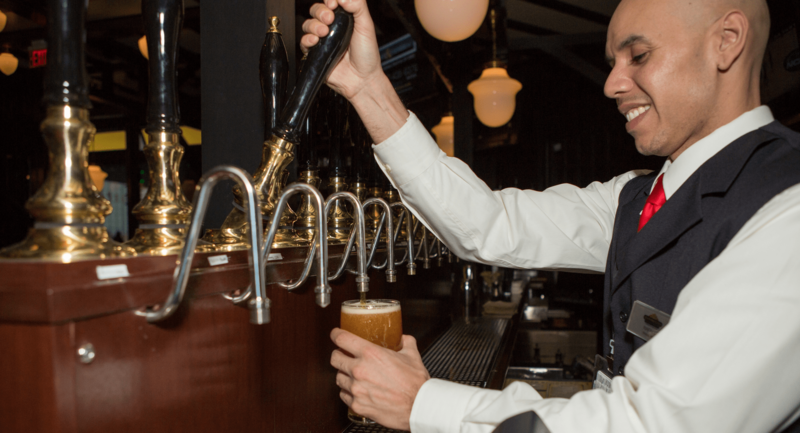 Impatient brew lovers will delight in Pinch’s tableside taps that allow thirsty patrons to ‘pour your own’. Pinch is the place to be with complimentary “Tap Attacks” where brew masters take over Pinch taps from 6 pm – 8 pm talking all things beer, offering gratis beer samples, fun prizes, and specialty food pairings made with the featured brews. Mark your calendars for upcoming “Tap Attacks” with Jonas Bronck’s Beer Company (broncksbeer.com) of Bronx, NY on September 20th; and Brooklyn Brewery (brooklynbrewery.com) on October 4th. Speaking of getting your game on, the all-new Dan Rooney’s Sports Pub (danrooneyscafeandbar.com) at Empire City features nearly 50 TVs and has quickly become a favorite destination for beer and sports fans. This official Pittsburgh Steelers bar (it is a replica of the original Dan Rooney’s in Pittsburgh, PA after all) offers a great selection of tap beer from local and regional breweries, as well as Irish favorites and domestic staples. The bar features a rotation of house-made brews by local Yonkers Brewing Co. (yonkersbrewing.com), such as Rooney’s Honey Blonde Ale and Rooney’s IPA. These craft beers like to travel too! There’s no need to forgo your favorite brew from either of these two locations and relegate yourself to cans and bottles when at home. Both pinch American Grill and Dan Rooney’s Sports Pub offer growlers which allow you to take your craft beer to go. Valet parking is recommended if you’re visiting either of these restaurants and is complimentary with a $50 minimum spend. You’ll find Dan Rooney’s just inside the valet entrance, and pinch is located on the second floor mezzanine level. Even Empire City’s Annual Fall Harvest Festival, which takes place trackside on Saturday, October 11th from 4 pm – 8 pm, is getting a craft beer makeover. The festival will have a Beer Garden with 5-tents overflowing with dozens of craft beers selected by the Pinch beer master. A neighboring Wing Tent will offer a variety of wing sauces, and a ‘wing-off’ contest will allow attendees to vote for their favorite wing flavor, which will then be featured on the trackside Empire Terrace Restaurant menu. If your buds love beer (whether that’s taste buds or friend ‘buds’), make your way to Empire City Casino. You’ll be hard-pressed to find a more expansive selection of New York-brewed craft beer anywhere else. Empire City Casino, one of the largest entertainment and gaming destinations in the northeast, features 5,300 of the hottest slots, electronic craps, roulette, baccarat and sic bo; year-round harness racing & International simulcasting; live entertainment including the best party, tribute and Latin bands, comedy, karaoke & more. A plethora of dining options will satisfy even the most discerning palate with Italian cuisine at Nonno’s Trattoria; trackside dining with live betting at Empire Terrace Restaurant; and convenient delicious options at the International Food Court or Grab ‘n Go. A new $50 million expansion added Dan Rooney’s, a high-energy sports bar, Pinch American Grill, in collaboration with Ducasse Studio, featuring dozens of New York craft beers on tap, and Alley 810, a craft cocktail lounge rounds out the entertainment options with retro bowling lanes. Empire City Casino at Yonkers Raceway is located at 810 Yonkers Avenue (off I-87 at Central Avenue) Yonkers, NY, Westchester County, open seven days a week from 9:00 am to 4:00 am. Visit www.empirecitycasino.com or call 914.968.4200 for information.